Escondido’s Congressman Duncan Hunter, an Alpine resident, won his last election by a 40-point margin in a District that was 44 percent Republican registered and 31 percent Democratic registered voters. No California Republican incumbent congressman ever has lost a race in a GOP-majority district. This time around, he can’t seem to get out of his own way. In recent weeks, Hunter has been involved in numerous campaign ethics controversies, under fire from the Federal Election Commission for spending campaign funds on video games and his son’s private school tuition. He toked on a vaporizer at a House Transportation Committee meeting as he sought to allow airplane passengers to blow vapors on flights. Hunter had to cut short some kind of junket to Israel this month to return home to deal with controversies. And guess what, the Israel trip was paid for with campaign funds. However, Hunter’s Congressional spokesman Joe Kasper said that was OK because he had been invited in connection with his position as a House Armed Services Committee member. That’s not all. Non-profit Citizens for Responsibility and Ethics in Washington identified campaign consulting payments of $11,000 to Hunter’s wife, Margaret, in 2011 and $39,000 in 2014 that didn’t appear on any personal financial disclosure forms filed with the House clerk. In response, Hunter’s congressional office last week asked the House Committee on Ethics to amend several years of financial disclosure reports. The Federal Election Commission (FEC) this week continued to question Hunter about his use of campaign funds to pay for video games, not once, but 68 times. Hunter’s staff said the wrong credit card was used. 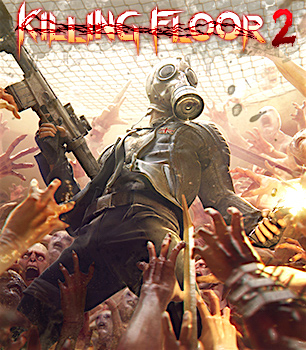 Hunter Jr. listed $1,302 worth of “Steam Games” on his finance disclosure statement for 2015. He also paid $1,650 of donated campaign funds to Christian Unified Schools at El Cajon where his three children attend school, later saying the payment was for tuition for his son. FEC officials wrote Hunter on April 4 that personal expenditures of campaign funds were strictly forbidden under federal election laws, although taking care of this transgression quickly would be taken into consideration as enforcement decisions were made. Since FEC officials originally had cited Hunter only for close to $3,000, the natural follow-up question was what was the additional $9,000 supposed to cover. Hunter campaign officials referred to, but didn’t identify, $5,000 in 2015 expenditures that were mistaken or personal expenditures as Hunter repaid the charges. Campaign officials also disclosed at least three charges amounting to $5,161 paid to Aston Kaanapali Shores Resort at Lahaina, Maui last year, adding those personal charges were reimbursed to the campaign fund as soon after they were incurred. A San Diego Union Tribune editor in the video below also mentioned unspecified charges for oral surgery, saying Hunter, as he was returning from Israel, told the newspaper he didn’t know what that was about and was going to look into it. And that was just from a fellow Republican. Eric Andersen, a member of the Central Committee of the San Diego County Republican Party and current Chair and Co-Founder of the Republican Liberty Caucus of San Diego County said Hunter has become a poster boy for Barry Goldwater’s famous quote: “Conservative principles so widely espoused and Conservative action so generally neglected. 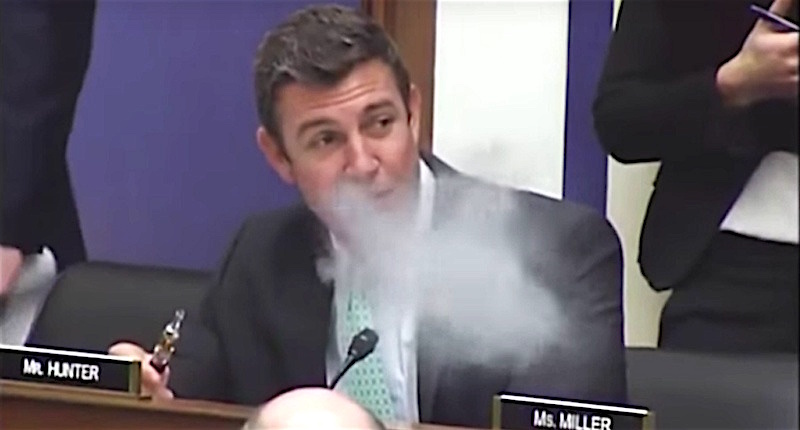 Duncan Hunter blowing from a vaporizer during House Transportation Committee meeting earlier this year. Continuing Hunter’s pattern of embarrassing optics if not misbehavior is his vaping during a Congressional Transportation Committee meeting last February. That’s certainly up for debate. What isn’t is Hunter’s actions during the House Transportation Committee meeting earlier this year at which an amendment banning vaping on airplanes was discussed. Not only did Hunter oppose the amendment, as Gawker reported and numerous videos posted on social media illustrated, Hunter whipped out a vaporizer and blew vapor into the committee air, causing the congresswoman next to him to wave her hand to blow back the vapors. The big question is how Hunter’s very vocal support of Trump and his other activities will play in the district that extends from Escondido to East County and is nearly one-third Hispanic in make-up. Analysts consider it one of the most conservative congressional districts in the nation. Gary Jacobsen, the University of California, San Diego, political science professor considered expert in local politics, told Jim Cramer’s TheStreet recently that Hunter’s endorsement aligns with his own political persona. Reality check. Donald Trump isn’t going to win. 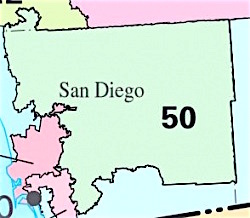 Hunter might win, but only because the 50th District is a gerrymandered ode to the power of his father, Duncan Hunter, Sr. who served in Congress from 1993 to 2009 finishing his career as chairman of the House Armed Services Committee. Will the 50th Congressional District stop living in the past? 2014 Fox News clip when Hunter said ISIS was infiltrating fighters across the Rio Grande into the U.S. Heard much about that lately? No, because it’s nonsense. 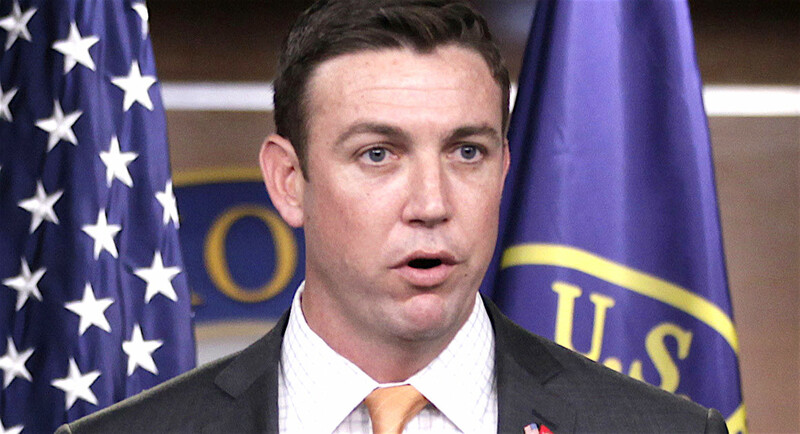 Congressman Duncan D. Hunter (R-CA-52) has picked up where his father, former Congressman Duncan L. Hunter, left off. The freshman member is doing his best to bring home the bacon for some of his biggest campaign donors, one of which is a company founded by his uncle. At the same time, Congressman Hunter touts his commitment to cutting government spending on his own website. It seems the best way to maintain government funding is to donate to Mr. Hunter’s campaign. Rep. Hunter requested $26 million in earmarks for General Atomics and $3 million for TREX Enterprises for Fiscal Year 2010. General Atomics employees are among his largest campaign donors, contributing at least $26,200 to his campaign and PAC since 2007. Employees of TREX aren’t far behind, donating at least $10,350 since 2007. “This time, a freshman member of Congress is carrying on the earmarking traditionsof his father.Freshman Representative Duncan. D. Hunter (R-CA) requested nearly $30 million inearmarks for two companies that have donated heavily to his campaign and are connected to hisfather, former Congressman Duncan L. Hunter (R-CA). Duncan D. Hunter waselected to hisfather’s seatin 2008 after his father retired from Congress. Current Rep. Hunter requested$26 million in earmarksfor General Atomics and$3millionfor TREX Enterprises for Fiscal Year 2010. General Atomics just so happens to be hislargest campaign donor,contributing at least $26,200to his campaign and PAC since 2007. Rep. Hunter’suncle founded TREXin 1978, but is no longer employed by the firm; currentemployees of TREX have given at least $10,350 to Rep. Hunter since 2007. Be the first to comment on "Say it ain’t so, Congressman Hunter Jr."